When Garabed and his father, Haroutiun Kojaian, left their beloved village of Efkere/Kayseri to immigrate to America in 1912 and 1913, they had no idea that it would be the last time that they would see their family, or their village. By the end of the First World War, still living in the United States, they were left with nothing but their memories, and a stack of letters that had been written to them from their loved ones in Efkere between the years 1912 and 1915. More than 100 years later, these letters have been painstakingly translated, and are presented here for the first time. 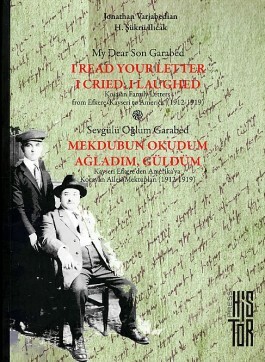 Written primarily in the provincial Turkish of the Ottoman countryside using the Armenian alphabet, the letters also contain passages written in the now-extinct Armenian dialect of Efkere. They provide a fascinating glimpse into pre-World War I village life in Ottoman Anatolia in this pivotal time for both the Armenian and Turkish peoples.